tips | Things Engraved Inc. SEND save the dates! You don’t want your guests to be in the dark about when your wedding is taking place, and giving them a heads up allows them to make the necessary arrangements to witness you tie the knot. Send them early enough. The general guideline here is 6-8 months before the big day. Giving your friends and loved ones plenty of time in advance ensures that they’ll be more likely to be able to attend, and gives you peace of mind that everyone you want there is aware. Win-win! BUT, don’t send them TOO early! On the opposite side of things, if you send save-the-dates too far in advance, guests are more likely to forget about the date. Moreover, the details of your wedding may change between that point in time and when you send out formal invitations. Be sure about who you send them to. Only send them to people who you are 100% sure you want to attend. If you send a save the date to someone you’re unsure about inviting and then change your mind later; it just creates an unnecessary and awkward scenario…yikes. Don’t worry too much about the design! Since your formal wedding invitations will come later, you can put much more thought and energy into those. Have fun with your save the dates, get creative, and let your excitement shine through. If you’re into sending them digitally, send paper ones too (as a backup). While technology is reliable 99% of the time (well, mostly…), there’s always a chance that an emailed save the date could get lost in someone’s junk folder. Sending them electronically is by all means a good option, you just may want to send paper ones as well. They can also make a great keepsake for the sentimental folks in your life. Be clear about who is invited. You don’t want your guests wondering if they can or can’t bring their kids, their new girlfriend, their dog…name the intended guests specifically and intentionally to avoid any confusion. As an extra gesture, add some special gift-giving to remind those closest to you (such as your groomsmen and bridesmaids who will be an integral part of your special day) to remember the celebration. We have our engraved black matte flask and white skinny mini shown above which make great options! We have always avoided adding that “subscribe to our email list” pop-up on our website. Personally I always found those pop-ups annoying and wished it was a practice that websites would just stop doing. Therefore, I did not endorse the idea of adding an email subscription pop-up to our ecommerce website. BUT time marches on and now in 2016 website pop-ups are more popular than ever and clearly not going away. In fact, it’s almost expected that when you visit an online retail website (or most websites) you will be presented with a pop-up. So instead of digging my heels in further I decided we should succumb to the pressure that one of the best ways to grow our email subscriber base would be to add a pop-up when you first our site. Our recent decision to stay with MailChimp as our ESP (for now) (read more about that here) included an initiative to use more of the MailChimp features and they have a pop-up builder on their platform. It looks very easy to use and I liked the fact that it only needed to be coded into the website once and then could be changed and modified through MailChimp’s interface. In the end we decided to go with our own pop-up code (using their API) since we mostly had that coded already. Before adding the pop-up our invitation to sign-up for our email list was displayed as a button on the bottom right hand side of our website FOOTER. Pretty hidden and inconspicuous. In the 12 months before adding the pop-up to our website our average monthly subscription rate was 137 new email addresses per month (so sad). Now that’s it’s a pop-up you’re presented with the opportunity to sign-up as soon as you enter the site as a new visitor (once per year). It’s a double opt-in method meaning that people also have to confirm their email address after filling out the initial pop-up form. For the first month of having the pop-up on our website (February 2016) our monthly email subscriptions grew by 371% over the last 12-month’s average… Wowza! We obtained 646 new email addresses to our list in the first month so I guess we’ve proven to ourselves that the pop-up does work. And who is going to complain about the pop-up when it seems to be standard practice in ecommerce today? We are happy with the results and excited about future changes to our email marketing strategy. MailChimp – Should we stay or should we go? We were recently faced with an email marketing challenge. Did we need to find a new Email Service Provider? Here is what we learned while evaluating ESPs and the decision we made. We were faced with an email challenge. For starters, we have used MailChimp since beginning our email marketing efforts four years ago. The vast majority of our email subscribers come from contests we run in social media and through website sign-ups (we offer a 10% online coupon when you sign-up for email). The database isn’t huge but it’s respectable. So the challenge… In order to remain compliant to CASL anti-spam laws we keep track of exactly how we obtained the person’s email address in a group called “Origin.” So the origin might be “Mother’s day Facebook Contest 2015” or “Website Signup.” However, where we ran into problems was when we hit the maximum of 60 fields in the origin group. Uh-oh! How were we going to keep track of how we obtained people’s email addresses? We decided it was probably time to spread our wings and find a new ESP (Email Service Provider). Also in the back of our minds was the hope of collecting email addresses in our 100+ retail locations. It seemed like a good time to shop around. We spent the better part of a week researching what we wanted in a new ESP and which vendors offered what solutions. We examined “The Sales Force Marketing Cloud“, formerly known as “Exact Target.” Our sales representative Adrian, at Bronto also gave us a demo of their ESP offer. Also under consideration was “InBox Marketer,” a local to us full-service marketing company with their own email platform. We briefly looked at “What Counts,” “Get Response,” and “Constant Contact,” too. We quickly learned that there are several different “tiers” of ESPs available from full service marketing agencies to the bare minimum. Could we solve our initial challenge that lead us down this road? Could the ESP handle unlimited numbers of “origins”? We quickly learned that all of the other platforms would include this type of data under the user’s profile vs. by having them added to a group. MailChimp appears to be unique in this vain. Was the creation of email a drag-and-drop method? While we have the capability to code html who knows what the future will hold and drag-and-drop is more user-friendly for everyone, including interns. What are the automation capabilities? – We want to get into sending “welcome series” emails so we wanted to ensure that any new ESP would include this function. Would we be able to scale? In the hopefully near future we hope to collect email addresses from customers in our stores at the point of purchase. Would the ESP be able to handle this extra data (e.g. what store we collected their email address from) and could we segment email campaigns based on their originating store? So the search began! We spent a week listening to sales pitches from the aforementioned companies and watching demos of the software each ESP was peddling. We got quotes and we considered some of them. Quickly we realized that all of the other ESPs could do #1, #2, and #3 on our wish-list; these were very standard. So it did not become a conversation about drag-and-drop, automation, and unique user fields. Rather, it became a conversation about scalability (#4) and cost (#5). How big did we need to go and how much was it going to cost? I found it really surprising that most of the “big folks” in the ESP game do charge you per send. For SalesForce (Marketing Cloud/Exact Target), InboxMarketer, and Bronto you had to pay BOTH a “licensing-usage fee” AND pay per send. Double whammy! I guess that’s how they make their money and make a great platform. But do we really need to pay twice for one service? Do we need to go with one of the BIG vendors? Paying per send really leaves a bad taste in my mouth. Why am I being penalized for growing my list? That IS my job to grow the list. But the bigger I grow it the more it’s going to cost me. I don’t like that. However, it did make me re-evaluate the metrics of “list size.” Is list-size really a good measurement? Probably not. I used the segmentation option in MailChimp to discover that over half of our email list hasn’t opened any of the last 20 campaigns we have sent. A good number of those emails are probably being sent to dead email addresses that no-one even opens any more. So we pruned our list by deleting everyone who hadn’t opened our last 50 emails. 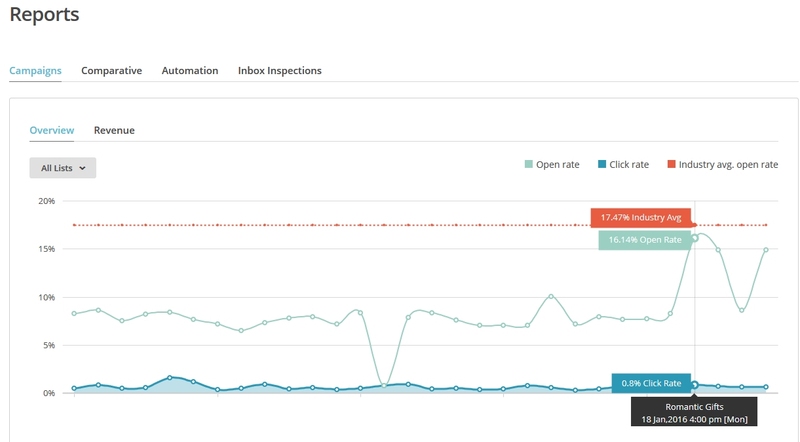 Of course, it cut down the list size dramatically and we’re only now seeing the positive impact that’s having on other key (more important) metrics such as open rates and click rates (see here). So through the process of hating the idea of paying an ESP per send, we were actually able to clean our list up and dump the ‘dead weight.’ It was painful to lose a huge chunk of the list but in the end it was the right decision and gives us better measures of our list’s actual success. Upon discussions with our IT group the feeling was that we are month (or more) away from being able to collect email addresses at the POS in-store. So maybe that “robustness” we were looking for isn’t necessary yet? Why pay for advanced features NOW when we won’t need them for months down the road? During this research phase we did start poking around more in MailChimp and although we see the ‘tab’ every time we’re logged in we’ve never explored the “Automation” capabilities of MailChimp. There is also this “eCommerce 360” option that we had never explored. Apparently we can bring our online sales data into MailChimp which opens up a whole new realm of possibilities with personalized email marketing. So the idea struck me that perhaps instead of changing ESPs we need to better utilize the features that are available to us in the platform that is already working for us. But that pesky challenge, the limit of 60 fields for our origin, still had to be solved. Would we somehow add this data to the user’s profile instead of having it associated with their group? It didn’t seem that possible in the user interface. Could we somehow group more of the origins together (e.g. Mothers Day AND Father’s day contest entries together?) to free up some of the 60 spaces? This was a very short-term solution. But a solution was found! We decided upon exporting the entire list, including all the origin data to save for our reference if we the CASL police ever want to know where we got someone’s email address from. Then we added just one origin to reference the excel file export that contained the actual origin information. Then added everyone from the contests etc. to the excel export reference origin. This way we still have a record for the CASL police AND we can continue to use MailChimp for the time being. Do we think MailChimp will be able to hold the extra info required when we start to collect email addresses in-store? Probably not. Even setting up “Store” as a group we’ll be limited to 60 stores and we have over 100 locations, so no, that will not work. However, as mentioned, we are months away from being able to add emails at store-level so we don’t need to worry about collecting store emails until we’re ready to actually do it. When that day comes we’ll have to begin at square one again and start researching more robust ESPs to see who can give us the best value for the money. We will now focus on using MailChimp to its fullest potential. We commit to keeping our list “clean” (removing dead weight regularly). The plan is to setup some automation – a series of “welcome emails” to introduce new subscribes to our list. Hopefully we can change our sign-up button on our website to also include a pop-up when you first enter the site – we learned that that has great success rates – and of course it does, EVERY SITE is doing it now; this will help us grow our list while we wait for in-store email collection. We will start using the “birthday” field to send offers to people on their birthday. AND we will look into getting eCommerce 360 setup so we can feed our web sales data into MailChimp and make a plan for how to better connect with our paying customers. In short, we will use more of the features of MailChimp and work to personalize the experience for our email subscribers before we put on our big boy pants and join the big guys, like Bronto, and the like.